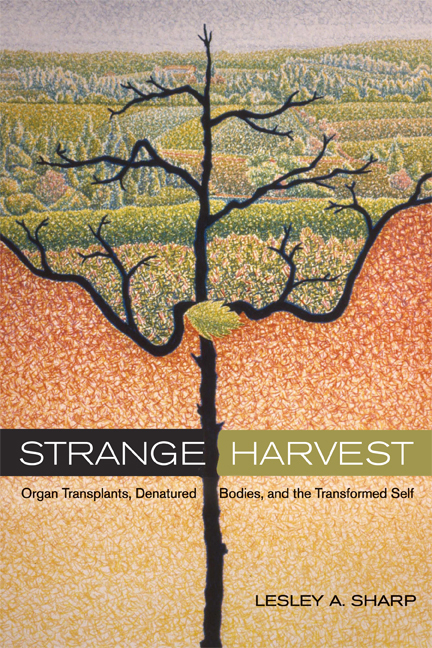 Strange Harvest illuminates the wondrous yet disquieting medical realm of organ transplantation by drawing on the voices of those most deeply involved: transplant recipients, clinical specialists, and the surviving kin of deceased organ donors. In this rich and deeply engaging ethnographic study, anthropologist Lesley Sharp explores how these parties think about death, loss, and mourning, especially in light of medical taboos surrounding donor anonymity. As Sharp argues, new forms of embodied intimacy arise in response, and the riveting insights gleaned from her interviews, observations, and descriptions of donor memorials and other transplant events expose how patients and donor families make sense of the transfer of body parts from the dead to the living. For instance, all must grapple with complex yet contradictory clinical assertions of death as easily detectable and absolute; nevertheless, transplants are regularly celebrated as forms of rebirth, and donors as living on in others' bodies. New forms of sociality arise, too: recipients and donors' relatives may defy sanctions against communication, and through personal encounters strangers are transformed into kin. Sharp also considers current experimental research efforts to develop alternative sources for human parts, with prototypes ranging from genetically altered animals to sophisticated mechanical devices. These future trajectories generate intriguing responses among both scientists and transplant recipients as they consider how such alternatives might reshape established—yet unusual—forms of embodied intimacy. Lesley A. Sharp is Professor of Anthropology at Barnard College and Senior Research Scientist in Sociomedical Sciences, Mailman School of Public Health, Columbia University. She is the author of The Sacrificed Generation: Youth, History, and the Colonized Mind in Madagascar (UC Press) and The Possessed and the Dispossessed: Spirits, Identity, and Power in a Madagascar Migrant Town (UC Press). Additional works focus on themes of body commodification and anthropological perspectives in bioethics.